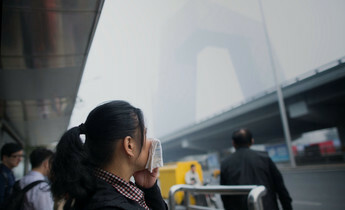 As seasonal smog shrouds China’s cities, triggering red alerts in Beijing and across the northeast, local governments have been deploying industrial “mist cannons” in a bid to remove toxic particles from the air. Images of water cannons, some three to four metres in length, have been broadcast by state media channels this week to show the nation that the government is acting on the urgent healthcare crisis caused by smog from coal and steel factories. However, critics say the cannons are ineffective anti-smog weapons, and serve instead to divert attention away from the root causes of pollution and enrich equipment manufacturers. After observing how air pollution levels tend to drop after rainy days, Chinese cities began using “magic smog cleaners” to deal with seasonal smog last year. Originally used on mining and construction sites to combat dust, modified versions mounted on trucks were distributed. This year the trucks have returned in force. An increasing number of cannons have appeared on the streets of cities in new parts of the country such as Chongqing and Changsha in central China. According to Southern Metropolis Daily, so far there have been 61 bids from different provinces requesting cannons, with Hebei, one of China’s smog hotspots, top of the list with 11 bids. The cannons work by spraying nebulised water droplets to trap dust particles in the air. But scientists argue that the cannons fail to combat the most hazardous microscopic particles that are most damaging to heath. The latest mobile truck-mounted machines cost around US$90 000 (620,000 yuan) each. The first bids for cannons date from 2014, after manufacturers started rebranding them as tools for environmental protection. According to the Nandu Daily, there were less than 10 manufacturers in China in 2012. However, a report from South China Morning Post found that sales have boomed since then with many unregistered products appearing on the market at a much lower price. 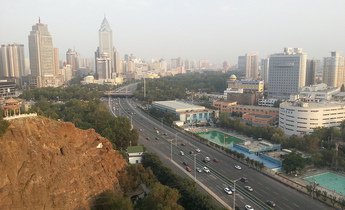 Environmentalist Cui Sheng, based in Zhengzhou central China, claimed that the trucks interfere with air pollution data when used near monitoring stations. The local effect of the cannons makes readings appear better than they would otherwise. The cannons are expensive and have a limited cleaning range so their utility has been questioned. Furthermore, it is unclear how effective the “magic smog cleaners” are in improving air quality. The method they use (often referred to as “wet scavenging” or “wet deposition”) can impact pollution by pulling down particles from the air. However, research shows that while the technology traps larger pollution particles, it is less effective for smaller, more dangerous PM2.5 particles. Manufacturers of the mist cannons refute this, stating that the water vapour is fine enough to remove PM2.5 particles. However, there is no clear evidence for this. Zhang Yuanxun, an expert in environmental sciences at the Chinese Academy of Sciences, expressed concern that some particles might react with water and expand. Alternative solutions using a similar idea have been suggested, most notably the use of artificial rainstorms from sprinklers. 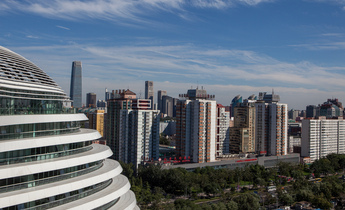 The idea came from Zhejiang University professor Yu Shaocai who, in a paper published in Environmental Chemistry Letters in 2014, suggested installing sprinklers on top of skyscrapers to imitate the effect of a rainstorm and clear out polluting particles. The idea has not proceeded past the testing phase. Even if the cannons are effective at targeting pollution, the water required for a large number of cannons would add to the stress on water resources. 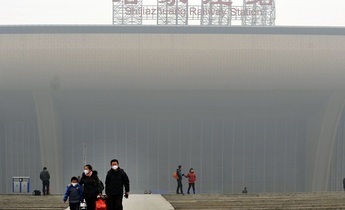 China’s industrial northeast, where many of the smoggiest cities are found, suffers from drought and water scarcity. A water diversion scheme pumps around 50 billion cubic metres from the south of the country to northern cities each year. The problem remains, with these types of technologies, that they address the symptoms rather than the causes of air pollution. To deploy mist cannons in all of China’s cities would require significant amounts of energy and water whilst providing only a temporary solution. As these resources are already scarce, the most effective way to combat air pollution is to limit emissions at source.